Bitcoin Press Release: Blockchain startup SherCoin has created a robust platform with a highly functional utility token, all designed to facilitate mass adoption through its blockchain-ecosystem. November 26th, 2018, Dubai, United Arab Emirates – Since 2017 the cryptocurrency and blockchain industry has been propelled into the mainstream to some success, however, solutions and platforms that are being produced in this present market do not necessarily possess user-friendly qualities and versatile application. It is estimated that 2.5 billion people have smartphones with 99.9% of the population not having cryptocurrency wallets. Digital currencies are adopted as a tool for financial inclusion, a remedy to inefficiencies within the traditional financial system and a means to exclude costly time-consuming intermediaries from cross-border transactions, yet, 1.7 billion adults don’t have a bank account. SherCoin ecosystem will also integrate with a mesh network platform to allow people with no internet access to use their applications, reaching a potential of billions of unconnected people. Research conducted by SherCoin has identified a critical problem with a majority of altcoins built on the Ethereum network (ERC20 tokens) – they are often single-use. With so many of these limited functionality tokens and platforms available, consumers are hard pressed to utilize their tokens effectively. Team SherCoin believes that a good token is one that is multi-functional with more than one utility with a singular application; breaking this mold is SherCoin (SHER), a token with five different related applications that tackle pain areas and incentivize mass adoption. SherCoin connects multiple cryptos in an ecosystem where they can be earned and spent across multiple platforms. 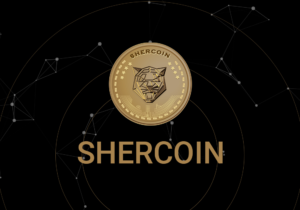 SherCoin is teeming with versatility and the applications in the SherCoin ecosystem provide functions that set it apart from any other ERC20 token on the market. Whilst designed for high-usability, they are both, practical for users and informative for businesses. Verify App – Users of this application earn SHER rewards for reporting suspicious products that are unverified within the app. Built on the Ethereum network in combination with RFID and NFC wireless tech, SherCoin provides protection for both users and businesses against counterfeiting through this innovation. The mobile application is available on both iOS and Android, and is presently in its alpha version and is due to go live Q2 2019. SherCoin Global Wallet – This is the defacto wallet for all applications within the SherCoin ecosystem. Through the user-friendly app, accessing SherCoin ecosystem will be simple for a majority of smartphone users. Survey App – Users of this application earn SHER reward for completing surveys and providing valuable feedback to the businesses. This application will be live Q3 2019. SherCoin Marketplace – Both through web and mobile devices users will be able to buy and sell products and services in exchange for SHER with minimal risk of price volatility and transaction fees. The Marketplace will be live Q4 2019. SherCoin Pay – SHER is an effortlessly redeemable token through various traditional gateways and furthermore will integrate with e-commerce sites, payments gateways and other platforms. SherCoin pay will be available in Q4 2019. 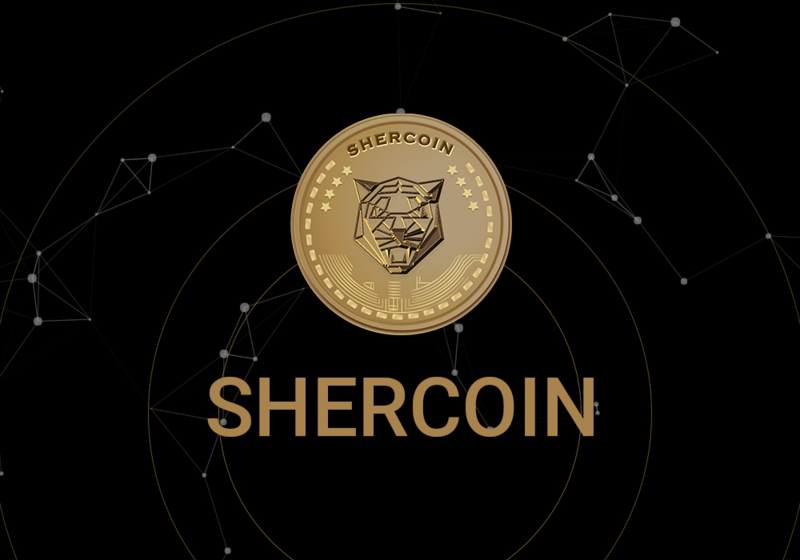 The SherCoin token sale is presently in its private sale phase which will last for 60 days ending December 19th with 75 million of 1.5 billion total SHER available; furthermore, there is up to 50% bonus for tokens purchased in this phase. Minimum purchase is 3 ETH, maximum 1000 ETH. Stage one of the main sale will begin Q1 of 2019 for a 90 day period, after which stage two will commence in Q3 2019. 600 million SHER tokens will be available over these periods. During this phase, the minimum purchase is 0.1 ETH, with a maximum of 500 ETH. The SherCoin team is also exploring innovative decentralized organization process inspired by DAICO proposed by Vitalik Buterin to protect the community. You can find more information in the Medium article. SherCoin is the source of this content. Virtual currency is not legal tender, is not backed by the government, and accounts and value balances are not subject to consumer protections. Cryptocurrencies and tokens are extremely volatile. There is no guarantee of a stable value, or of any value at all. Token sales are only suitable for individuals with a high-risk tolerance. Only participate in a token event with what you can afford to lose. This press release is for informational purposes only. The information does not constitute investment advice or an offer to invest. The post SherCoin Platform and Token Redefines Utility Token Functionality for Mass Adoption appeared first on Bitcoin PR Buzz. Bitcoin Press Release: ZAZA, a blockchain business platform designed to revolutionize the way business is conducted, has announced its token pre-sale, beginning June 5th 2018. ZAZA aims to introduce transparency and innovative solutions into the B2B industry. 19th April 2018, Dubai, United Arab Emirates – ZAZA platform , a blockchain startup designed to help businesses improve their activity and add heaps of transparency to their setup, announces a start date for its token pre-sale as the 5th June, 2018. The project will help companies and organizations enhance their business efficiency involving blockchain as a key factor in their daily operational performance. By proving a global business-oriented network, the platform will give way to strategic alliance exposure and trustworthy connections. The platform has identified issues that plague today’s businesses and the way they connect with each other. By utilizing decentralization and its efficiencies, ZAZA platform brings Deal visibility, Trading and Business Connections into a whole new Smart level. Interaction without boundaries provides for users the possibility to use ZAZA’s database as a unique business searching tool , minimize costs and increase profitability. E-commerce platforms have their own set of problems: high commissions, unreliable reviews, complicated refund policies and slow transactions. ZAZA platform is designed with these issues in mind. The platform banks on the power of blockchain and gives the perfect solution by making transactions secure, fast and cheap. Being a multi-sided platform, the network effects to scale the user community with gamification for incentives like earning ZAZA tokens for validating new joiners and endorsing companies , products and services that are rated by end users. Buyers and sellers are given unprecedented access to a world wide audience with an individual rating system, allowing business to know beforehand, the standing of a party they will start dealing with. The benefits are obvious – no longer will business blindly be led into negotiations, and the potential pitfalls they can bring. ZAZA platform’s Deal Generator is a highly innovative solution for an incumbent market. It allows deals to be organically created in the shape of inquiries and allows users to view them in real-time, giving the inquirer immediate feedback and offers. The difficulty of tracking negotiations is often high – with ZAZA, the problem is no more. Requirements will be made immediately obvious, eliminating misunderstandings. The Trading Platform gives businesses a place to promote a wide range of products and services, without any charge and start receiving offers. The offers are completed using Smart Contracts, giving both parties peace of mind about the quality of said services/products and the huge benefit of transparent transactions. In a market where trust is such a large factor, this feature is invaluable. As a B2B network, companies and organizations will be able to connect at a worldwide level, transcending physical boundaries. The need to search for partners and connections in a time consuming manner is over – at the touch of a button, businesses are able to get an overview of the market, whilst transparent reviews enable clarity for all. This will give sellers and buyers more options to trade and a far larger market, giving companies the leg-up on the competition. ZAZA platform will be using its own token, the ZAZA token for trading. With a total supply of 1 billion, 53%, or 0.53 billion ZAZA will be available for early backers. The pre sale starts on 5th June with a tag price of $0.07 per ZAZA token with bonuses that range from 25% to 50%, dependant on the invested amount. For more information on the token sale, visit ZAZA’s website. The platform is set to launch in Q1, 2019 and the mobile based applications (Android and iOS) are to be developed in the second quarter. The launch of the platform initially covers the UAE, with European markets in Q3 of the same year, and North America by the start of 2020. The platform will be fully global by fall of 2021, catering for B2B businesses worldwide. What benefits will ZAZA platform bring to your business? ZAZA platform will help you not only succeed but excel, allow you to find the best partners in the market, and will grant support, reliability, and transparency. To find out more, visit the website, or visit the whitepaper. ZAZA is the source of this content. Virtual currency is not legal tender, is not backed by the government, and accounts and value balances are not subject to consumer protections. Cryptocurrencies and tokens are extremely volatile. There is no guarantee of a stable value, or of any value at all. Token sales are only suitable for individuals with a high risk tolerance. Only participate in a token event with what you can afford to lose. This press release is for informational purposes only. The information does not constitute investment advice or an offer to invest. 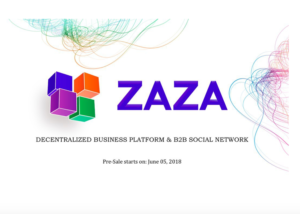 The post Business Activity Optimizer and B2B Social Network ZAZA Announces Pre Sale for its Native Token appeared first on Bitcoin PR Buzz.